Now most people would wonder why Spencer Tracy did not buy those much needed new pants with a credit card. Ever notice how cashiers today ask if you will be paying by credit or debit? Whatever happened to cash money? You know, legal tender? When people see me handing over cash out of an envelope, they often ask about Dave Ramsey. I usually laugh. My husband and I have been cash-envelope people long before Dave Ramsey was giving budget advice. Actually, I started this system around the time Mr. Ramsey was in bankruptcy. Although his system is well known now, he has always said that nothing he advises is new and probably close to how our grandparents used to handle money (before credit cards). My husband and I got the envelope idea from a friend and it just stuck. That is not to say that we had not used credit cards, we had, and it took us years to pay them completely off, but we did get there. When we moved to Georgia over fifteen years ago, we were completely debt free—completely. That changed, however, the moment we signed the papers for our first house. We did not remain debt-free except for the mortgage as I wished we had, but I still had an envelope system. I have never paid a utility bill with plastic—really, never. We did not even have any monthly direct bill pay until we got Netflix about a year ago. We stay as low tech as we can. I do use a credit card for online purchases and transfer from an account to pay the balance off before accruing any interest charges. I do not even write checks except for charities and that was on the strong advice of a tax attorney. Some people think we are a bit old fashion in how we handle our finances, but it does minimize our exposure to identify theft and employees of companies having access to our bank accounts. Plus, it helps our credit card company and our bank to recognize suspicious behavior; over the years, twice they caught a thief using our credit card number before the charges even posted to our account online. Going to a cash system is not a lifestyle that works for everyone. I pay the bills I can in person and the few others are paid with postal money orders that I buy with cash. I keep receipts. The actual money is in my hands and goes out from my hands. I see the exchange. I feel it. I decide if the item is really worth what I am handing over. It is not an invisible exchange of numbers, as it is with plastic. I can look in my budget envelope and see exactly how much money I have left and make decisions based on that see-it-right-there reality. I have a system that is frugal and simple. My budget is designed on a per paycheck basis which is bi-monthly for us so that is 24 paychecks a year. First, I take the utility bills for the last twelve months and add them together, then I divide that number by 24 (the number of paychecks in a year) and add 10% more. This gives me an average amount with a bit extra just in case the bills are higher than they were due to more usage and/or cost increases. My water bill looks something like this. Last year we paid $276.45 exactly, but another way would be just to use rounded numbers for each month's bill to the nearest dollar, which is usually within just a few dollars of the actual figure. In this case, the rounded monthly numbers equaled $277, and that is as close as it gets. Dividing $277 by 24 is $11.54 plus that extra 10% (or times 110%) making it 12.69. I do not put coins in my budget envelopes so this number becomes $13 per pay check. When I first began this system I kept a separate envelope for each the utility bill, but as I gained confidence with it, I began grouping all the utility budgets in one envelope. In that case, I would just use the average amounts per pay for each company adding them all together and then adding an extra 10%. Each year about this time, I clean out the file cabinet of the bills from two years ago to place in storage, keeping last year's receipts handy but clipped together and the figure written on a sticky note of the average monthly cost. My system starts with No. 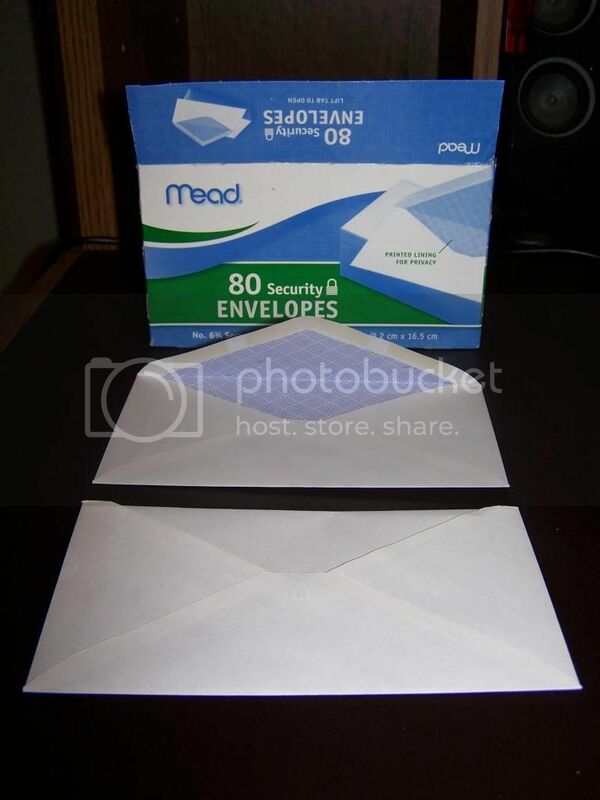 6¾ envelopes. I first tuck in the flap. The top one is my new envelope for utilities and the bottom one was used for the last year. Actually both the electric and the gas bills were less this past year than the year before because we had a mild summer and a mild winter for the most part, plus we turned off our hot tub because it was leaking. However, I decided to keep them at the same levels as the year before because we plan to fix the hot tub in the next few months and weather is far too unpredictable; I rather budget too high than too low. I do not like to mess with $1 bills so I always round up to $5 for the per pay budget figure at the top of the envelope. For personal expenses, I estimate and label the expenses for which I expect the money to be used, like hair cuts, clothing, and gifts. Along the bottom side of the envelope, (where the camera strap is hiding the corner) I keep a tab of how much money is in the envelope after I have separated the money. I used put the amount of what is left after taking money out, but now I just leave the receipts that fit in the envelope until the next time I separate the money. 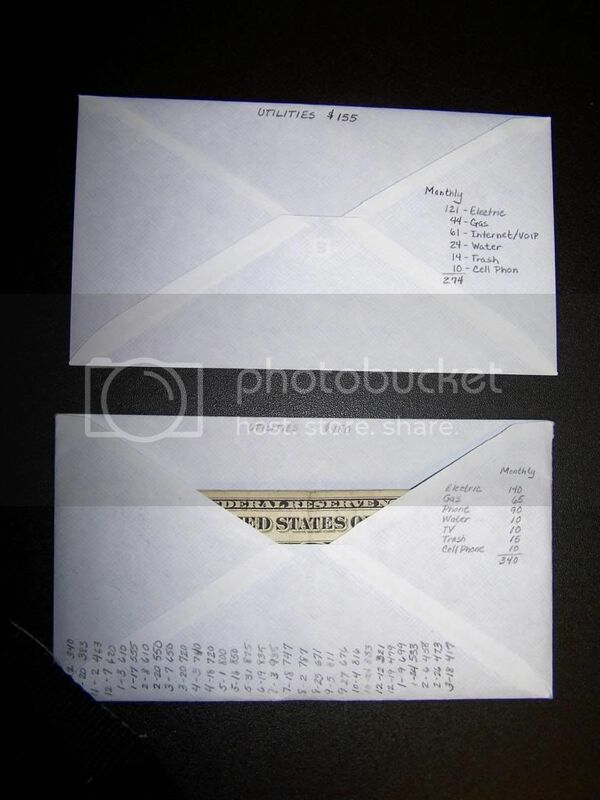 I can easily see how much money is in the envelope because it is not closed up. When I started this over two decades ago I bought a large black leather wallet that is longer than the envelopes and just folds over so they fit in it snugly and yet are accessible. It has served me well. I have never lost any money out of it. Now for the benefits of a cash envelope system like this, we have never had to put off paying a bill because we lacked the funds which happened when we both were dipping into the checking account the first few years of our marriage. We had many lively discussions about how to handle the money then before my husband relinquished the home money managing to me; being that his first wife had maxed out all their credit, it was a huge step toward trusting me, but I knew that I leaned more the saver and he more the spender. I also knew that he had to have his own "mad money" to spend however he wished to be happy. Once he realized that he could spend some money however he wanted; I had talked our credit card companies down to low interest rates; bills were being paid before their due dates with no extra charges; our debts were being paid off and we were not accruing new debt; and even saving some money all at the same time, he relaxed a little. For the last four years we worked on getting debt-free except for our mortgages even through a very tough financial time and after charging the cost of a mini van and we reached that goal in October 2012. We are now saving money to replace the siding and windows of our house, without going into debt to do it...hopefully! I am concerned about the mileage on my husband's work van, we may need to replace it soon, but I am just trusting God that He will guide us as He has done. That is really where the budget all starts, with prayer and listening. You cannot plan for everything, but I have learned that God knows what is coming and will provide. There have been times I had saved up money for one thing, only to end up spending it for something unplanned. I would be disappointed that our plans were changed, yet thankful that we had the money at the same time. If we had already spent it on the plan, then it would not have been there for the unplanned. God has this really amazing timing and I am most thankful that He is my Lord. When my parents started paying me an allowance and told me how to divide my money into savings, spending, and tithe as a kid, I instituted the envelope system, long before Dave Ransey too!! I've moved to disciplining myself through using an excel spreadsheet budget and planning ever expenditure, so no longer need cash/envelopes, and am debt-free except a mortagage,too! It is a really great tool and I'm so glad you have found success with it!! My daughter also has a spending, savings, and tithe system. Currently, we do 40%, 40%, and 20% respectively. Soon we will be implementing a change so that she will be buying her own toiletries and allowing her to choose her preferences weighing the costs of them. I think that then budget plan is going to be of greater importance to her on a more personal level. I like knowing how much I can spend, so I try to avoid using plastic to pay for anything too. I also think that sticking to a cash system allows for me to be better at budgeting. The system may be old fashioned, but it does work. Thank you for your thoughts, Brooke! Old fashion does not always equate to obsolete! We were looking into refinancing the mortgage to lower our monthly payment, but we have been and still are in this no man's land according to those who determine such things. The good news is that we are also in a place that most people would love to be,so we have been told. The first mortgage will be paid off in less than six years and the second within a year later...and we are not upside down with the mortgages even though the housing market is still in a very bad state here with our house valuing about 50% of what it was. I give all the credit to my Lord and His guidance on budgeting!